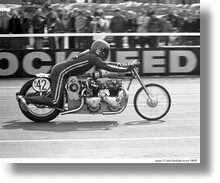 We will start this page with some bike action and two shots of Stu Bentley on his twice 650cc Triumph-powered bike which he called Centaurus. Stu went in for a centrally mounted blower with the engines canted over to minimise the space required. Quite an elegant solution if you ask me. 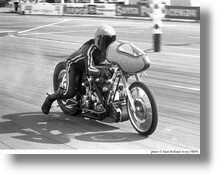 The late Ray Feltell riding Penetration. 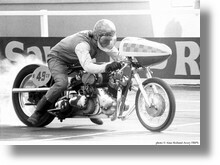 This is Phil Eeles riding Mirage which also featured two 650 Triumph lumps. Phil favoured the supercharger being placed behind the rear engine. I am not sure I would like something rotating so quickly in such close proximity to me vitals but these bike riders are a breed apart. 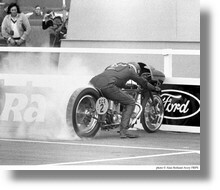 On the left is Mick Butler burning out on Cyclops his blown 500cc Norton which he rode when he wasn't riding . . .
. . . Pegasus the mighty blown Vincent of Derek Chinn and Ian Messenger. I don't know which of them is riding in the shot on the right. 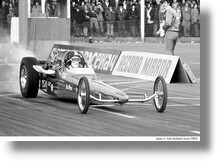 I have no idea why Clive Skilton was getting a push up the strip in the Skilton Fraser Revolution 3 Top Fuel Dragster, and I guess it will probably have to remain one of life's little mysteries. 1972 saw the debut of the Priddle/Riswick/Stanford & Gane Mr Six fueler and these two shots show the timeless elegance of its lines. It looks like the team took the win in Top Fuel at this meeting. 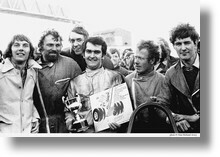 Below from left to right : Radio Luxembourg DJ Dave Christian, the late Pete Stanford, Dave Riswick, Dennis Priddle, Terry Axe and Tony Gane. 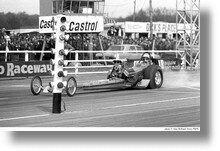 A fairly early shot of Santa Pod's Firefly Top Fuel Dragster which at this time was fitted with a 392" Chrysler mill. 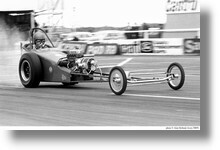 A 426 cubic inch 'Big Daddy' Don Garlits-built Dodge was substituted later in the season. The cowl was cut away later in order to make getting in and out of the car easier. 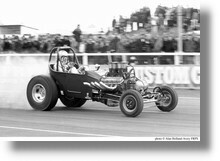 The late Allan 'Bootsie' Herridge is almost certainly driving the car when this picture was taken. You can read an article on Firefly, which was written by Mike Lintern and originally published in Custom Car, by clicking here. 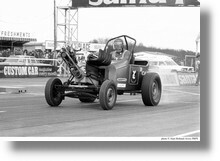 This is Denis Acott driving Helkat his Jaguar-powered rail. That is not the most elegant roll cage I have ever seen but it certainly looks sturdy enough which is all you really want I suppose. 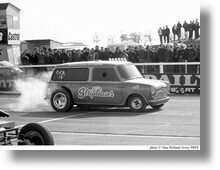 An interesting car this - Mike Sayers' rear-engined Hillman Imp-powered Impact dragster. 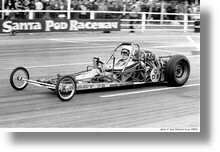 Ray Hoare's rear-engined Saxon dragster which made its debut in 1972. You can read an article on the Saxon RED, which was written by Mike Lintern and originally published in Custom Car, by clicking here. 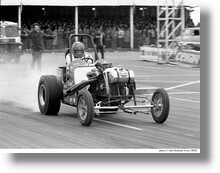 A couple of shots taken with Alan's trusty motor-drive showing Bruce Brown burning out in has Age Machine injected big block Chevy digger. 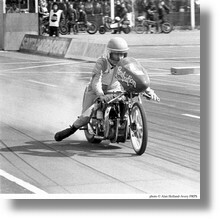 John Whitmore in his tiny BMC-powered Drag'n'Fly dragster. Tiny it was, slow it wasn't - a quite amazing car. This is Dave Stone burning out in the Stones' Senior Competition Altered. It began life called Doo What but at some point was re-christened Tee-Rat and the rest, as they say, is history. You are looking at at a very clever man indeed. 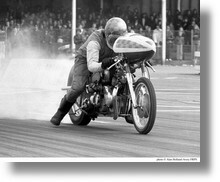 Freddie Whittle built his Shutdown AA/FA to an extremely high standard of workmanship which included making the body out of sheet aluminium. You can read a very interesting article on the construction of Shutdown, which was written by Mike Lintern and originally published in Custom Car, by clicking here. 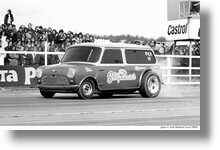 This is the first version of the legendary Stripteaser Jaguar-powered Minivan campaigned by Roger Bishop and Bob Messent. If you wish to more about Stripteaser you can read an article written by Mike Lintern and originally published in Custom Car by clicking here. 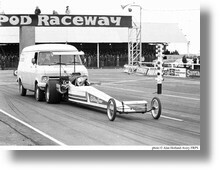 Kevin Pilling driving his Pure Seven 440 cubic inch Dodge-powered competition altered. There is also an article on Pure Seven written by Mike Lintern which you can read by clicking here. Alan Sherwin at the controls of his supercharged Jaguar-powered Model T which he called Travel Agent. This is undoubtedly the famous Invader competition altered of Colin Mullan and Reuben Johnson. The car originally featured a Vauxhall Viva HB body, but it was subsequently completely re-built and the body was changed to this Vauxhall Firenza body shell. This picture must have been taken shortly after the new car debuted because the signwriting has yet to be added. Time now for a few street cars. 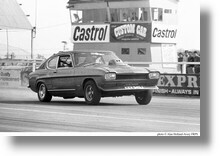 Mike Hall was the Editor of custom Car magazine in 1972 and here he is driving this Ford Capri street car. 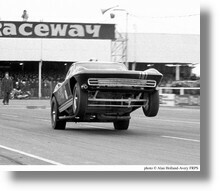 Rod Foley burning out in his AMX street car. This is Gary Goggin driving his Super 'Vette which, incredibly, he used to drive to the strip. Gary went on to campaign a Pro Stock Camaro when he tired of the Corvette. 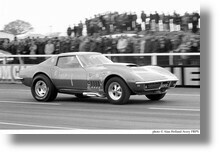 Santa Pod Raceway's Wheelie Stingray with Bob Phelps at the wheel. This car is still gracing the strips in the hands of Ronnie Picardo. have provided valuable information for the captions on this page.